Talking with loved ones about what type of care they’d like to receive at the end of their lives sounds morbid, but these preferences shouldn’t be kept secret. Experts say planning for end-of-life care is key to helping ensure that your loved one has the best possible quality of life during their final days, while providing guidance for their healthcare team and family. According to the Conversation Project, a national collaborative effort to support end-of-life discussions, 90 percent of people say that it’s important to talk about what your aging parent wants at the end of life – yet only 26 percent of adults have had that conversation. End-of-life planning means considering all the details surrounding the end of life, from your loved one’s preferences for health care and palliative care to the possible impact of grief and loss. You and your aging loved ones will also have to consider whom they can legally identify to make decisions on their behalf if they cannot. It’s worth knowing that Medicare beneficiaries have the option of scheduling an annual appointment with their doctor purely for the purpose of going over end-of-life plans. The advantages of end-of-life planning include clarifying your and your family’s values, and ultimately reducing family conflict by providing clear instructions during some of the most difficult decisions loved ones have to make. “Advance care planning is the process of reflecting on what is important to you, documenting it and talking to your loved ones,” says Anna Gosline, a member of the Honoring Choices Massachusetts Coalition and senior director of health policy and strategic initiatives for Blue Cross Blue Shield of Massachusetts. This process includes the important steps outlined below. Where would I prefer to spend my last days? At home, or in a healthcare facility? How aggressive should my treatment be? At what point should physicians stop trying to preserve my life? Do I want to know all the details of my condition, if I am approaching death? What level of awareness would I like to have during my last days? Who would I like to see before or during my last days? Who among my friends and family will be most able to carry out my wishes, and could serve as my healthcare proxy? The Conversation Project’s Starter Kits can help with this first step. Use Medicare’s Advanced Care Planning benefit to schedule an appointment with your family member’s physician to start discussing end-of-life care options. Ask what special considerations might apply to your loved one’s health condition and prognosis, if applicable. This is also the time to figure out whom your loved one wants to serve as a healthcare proxy (if not you), and to then ask them if they are willing to take on that role. If they agree, discuss specific wishes as well as general guidelines for making decisions on your aging relative’s behalf. Choose someone who will be able to speak up on your loved one’s behalf and make the decisions they want made. A Healthcare Proxy formally identifies the person who will make decisions for your loved one and an Advance Directive outlines many of your aging loved one’s wishes for care. Each state has its own forms, so be sure to get the right forms for your state. It is also going to be their responsibility, not your doctor’s, to share these documents with people who need them. It’s a good idea to make several copies of each document. Once you have a general idea of what your loved one wants, it is important to discuss their wishes with the people around you. In these conversations, your loved one should share whom they’ve chosen as a healthcare power of attorney and also provide information about their end-of-life priorities and values. Your loved one’s end-of-life care preferences can change as their health and perspectives change. When they’re healthy, they can begin the end-of-life care planning process by identifying a proxy and talking to a physician in general terms about what to address. If they have a chronic condition or another diagnosis, you can get more specific with both the proxy and their doctor about the prognosis and possible outcomes. And, as they approach the end of life, you can all talk more about shorter-term goals and needs for the best possible quality of life in your loved one’s final days. If you’re still wondering how to tackle this challenging topic, we’ve put together a list of questions to help you and your loved one get started pulling together the information that can be essential for successful end-of-life planning. Where are important legal documents located? This includes all information pertaining to the person’s will and estate including executor name or names, Durable Power of Attorney, Medical Power of Attorney, HIPAA, Living Will, DNR directives, etc. This also includes Social Security cards, birth certificates, marriage certificates, divorce papers, real estate documents, car titles and anything else you can think of. If former military, what branch did they serve in, what dates, what was their discharge date and status and where are their discharge papers? Do they have a safe deposit box? If so, where is it located and where is the key to access the box? Do they have a life insurance policy? If so, what is the company, account number, and contact information? Do they have medical insurance? If so, what is the account number and contact information? Do they have long-term care insurance? If yes, what are the company, account number and contact information? What are their bank accounts as well as mortgage, credit card and investment accounts? Include company names, account numbers and contact information. Where is a list of user IDs and passwords for all of their online accounts? Who are their current doctors and what is the contact information? What are their current prescriptions, dosage amounts and pharmacy contact numbers? How can you gain access to their home, including the keys and security code(s)? Who are their closest neighbors or friends to contact in case of an emergency, and what is their contact information? If your loved one needs assistance or daily care, do they prefer an assisted living community, a smaller care home, in-home care, VA facility or other? Have they already made arrangements for continued care? If so, what is that information and where is any documentation? How should you approach taking your loved one’s driving privileges away and making other transportation arrangements when you know it’s time? If their home needs to be sold, do they have any specific instructions? If they can no longer take care of their pet(s), what is the vet contact information and where would they like their pet(s) to go? Stop all the drugs and preventative measures, only giving medication for discomfort or pain, when they can no longer _____________________________________________. Do they want a funeral in a church, a party, a wake, or none of those? Do they have written instructions for a memorial service and if so, where are these instructions? Where will their final resting place be or where do you want your ashes scattered? What is their religious affiliation (if applicable) including where they worship and a contact name and number? Do they want an obituary in a local and/or out of town paper? Have they written one already? If so, where is it? If not, what do they want in their obituary? Do they want flowers for services or donations made in their name to a favorite charitable organization? Are there specific persons they want notified upon their passing, and what is their contact information, including email addresses and phone numbers? If not included in a will, are there special items they wish to go to specific family members such as furniture, photos, keepsakes, memorabilia and more? Name information and dates of all marriages and children your loved one has had, including divorce and death dates if applicable. Last, for future family members more than anyone, ask your loved one the following questions and record their responses using the recording capability on your mobile device or computer. Tell me your earliest memory as a child. What was the best trip you ever took? The more you can ask and record, the more future generations will know about their family and past. To “palliate” means to ease discomfort by treating the symptoms of an illness. Palliative care promotes the patient’s comfort by addressing any and all issues causing physical or emotional pain or suffering. Also known as end-of-life care, hospice is palliative care designed to help the patient through the last stages of a terminal illness. The goal is to keep pain and suffering to a minimum, not to cure the illness — by this point, the patient’s doctor has determined that the patient can no longer benefit from regular medical treatment. Although hospice care is usually administered in the patient’s home, it can also take place in a hospice facility. 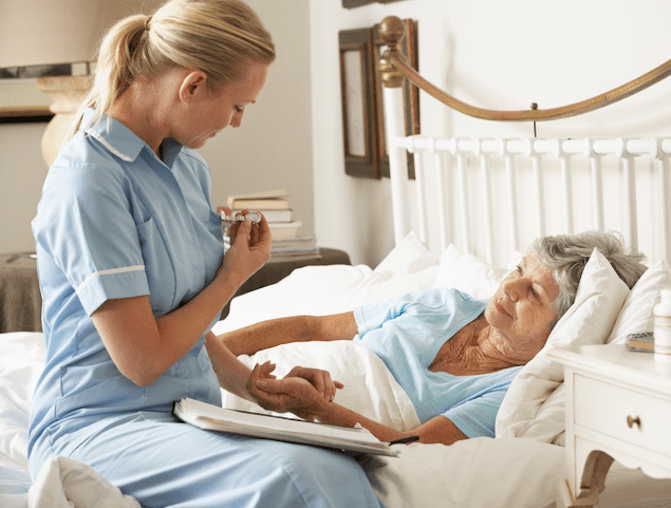 When necessary, hospice services can also be called into assisted living facilities or skilled nursing facilities, as long as those facilities carry a hospice waiver. Medicare is the main provider of hospice care in the U.S., but Medicare Part A only pays for hospice care provided by Medicare-certified programs. Some Medicare supplemental insurance (Medigap) plans also cover hospice care. Medicaid, long-term care insurance policies (LTCI) and Veterans Benefits pay for palliative hospice care. For more information, visit our Hospice Care page. These days, everyone from poets to professors, priests, and everyday folks all opine about what makes a “good death.” In truth, deaths are nearly as unique as the lives that came before them — shaped by the combination of attitudes, physical conditions, medical treatments and people involved. Still, many have pointed to a few common factors that can help a death seem good — and even inspiring — as opposed to frightening, sad or tortuous. By most standards, a good death is one in which a person dies on his own terms, relatively free from pain, in a supported and dignified setting. Some of patients’ most common end-of-life priorities include being at peace spiritually, knowing that they have the support of loved ones, having their affairs in order and being reassured that they won’t have a painful death, says Wulfestieg, who has worked in hospice care for 14 years. Most Americans say they would prefer to die at home , according to recent polls. Yet the reality is that some three-quarters of the population dies in some sort of medical institution, many of them after spending time in an intensive care unit. Part of that may be due to misunderstandings about the different options for treating a patient’s pain in their final days. “There are still people who are uncomfortable with the use of pain medications at the end of life, even as their use is essential for the patients who are in pain,” says Warraich. As life expectancies increase, more people are becoming proactive. A growing number of aging patients are choosing not to have life-prolonging treatments that might ultimately increase pain and suffering — such as invasive surgery or dialysis — and deciding instead to have comfort or palliative care through hospice in their final days. Along with the practical matters of having one’s affairs in order, it’s equally important to prepare for death emotionally, to spend time with loving people toward the end of life, and to have spiritual sustenance. “Patients really want to know that their life had purpose, that they made a difference and that their lives mattered,” says Wulfestieg. “It has to do with family a lot of times, saying those I love you’s and goodbyes.” The SCHF often works to reunite dying patients with family members, including those who have long been estranged. The right company can help aid a “good death.” Although dying may be scary or sad or simply unfamiliar to those who are witnessing it, studies of terminally ill patients underscore one common desire: to be treated as live human beings until the moment they die. Most also say they don’t want to be alone during their final days and moments. This means that you should find out what kind of medical care your loved one wants administered or withheld and be sure that the medical personnel on duty are fitting in skill and temperament. Favorite activities or objects can be as important as final medical care. You should ascertain the tangible and intangible things that would be most pleasing and comforting to your loved one in the final days: favorite music or readings, a vase of flowers, a back rub or foot massage, being surrounded by loved ones in quiet or conversation.Spirituality can also help many people find strength and meaning during their final moments. Think about your loved one’s preferred spiritual or religious teachings and underpinnings, since ensuring access to this can be especially soothing at the end of life. Grieving may begin even before your loved one dies. Families whose loved ones have experienced long illnesses or years of dementia may already have experienced anticipatory grief as they prepare for the death. Saying good-bye is the first active step. Saying good-bye to a dying relative or friend — what to talk about, when, and how — doesn’t come naturally to most adults. The irony: All such conversations ask of us, ultimately, is what people appreciate hearing at any time of life: words of candor, reassurance and love. To help you through this difficult time, we’ve put together a list of tips for people preparing to say their final good-byes to a loved one. 1. Don’t wait until the last minute. Few people actually can predict when that last minute will be. Say what you need to say now. 2. It’s OK, even comforting, to let on that you know the end is nearing. 3. Follow the dying person’s lead. If the person talks about impending death either directly or indirectly through metaphor, go along with that. 4. The truth is good — but so is the little white lie. There’s no need to burden your loved one with a painful truth. 5. Keep talking even if you’re not sure you’re being heard. Many experts believe that even loved ones who appear to be unconscious or uncommunicative may be aware that you are present and speaking to them with love. 6. Try to stay present — don’t get ahead of yourself. 7. Trust your instincts, not “the rules.” You’ll get plenty of advice on how to say goodbye – you know your loved one best. You may have heard or read about the five stages of grief. It is important to bear in mind that this is not a linear process. You may experience one stage for a while, go through a few more stages quickly – and then seem to start over again. Grief is a natural process, but if you can’t seem to function in your daily life and symptoms of grief remain strong six months after the death, seek help from a health care professional. Losing a parent, spouse, or other loved one is really hard. What most of us don’t know, until it happens, is that it hurts for a long time. According to experts, though, there are recognizable stages — or signposts — that you’ll pass through as you move from bereavement to healing. In her landmark 1969 book On Death and Dying, psychiatrist Elisabeth Kubler-Ross popularized the idea of five stages of grief. Since then some experts have continued to work with Kubler-Ross’s model, while others have simplified the theory to include just three or four stages, or expanded the list to as many as ten. But most experts agree that everyone processes a loss by experiencing a series of different feelings, though we may go through these stages in a different order or skip one altogether. Here’s a guide to the stages of grief and how to navigate them to find comfort and healing. For the first hours, days, even weeks after someone you’re close to dies, you may feel like you simply can’t absorb what’s happened. It might feel like there’s a glass wall between you and your feelings. You know you’re sad, but you can’t actually grieve. The numbness protects you from dissolving, but it may feel a bit frightening, too — why can’t I cry?Losing someone you’ve lived with may also bring intense feelings of loneliness and emptiness as you struggle with the hole left in your daily life. If you’ve spent the past months or years as a caregiver , it’s natural to experience a sense of being cut adrift — after giving so much of your time and devotion to your loved one, suddenly you are no longer needed. Alienated from other people, as though everyone else exists in the sunny world of everyday events, while you’re in a dark tunnel. Bereft of purpose. Many caregivers say they feel painfully lost, as if the connection that kept them going every day is no longer there. Memory gaps, such as being unable to recall what you did yesterday, or not knowing how long it’s been since you last ate. Being disorganized and “spacey” — misplacing your keys or cell phone, losing your car in the parking lot, forgetting to return phone calls. Feeling out of touch with your real feelings, reacting in ways that don’t feel like “you,” such as snapping at a sibling or feeling nothing when a friend tells you some happy or sad news. Give yourself permission to feel however you feel. You’ve just been through an emotional earthquake, and the aftershocks are going to continue for a long time. It’s okay if you can’t cry, and it’s also okay if you cry all the time or at inappropriate moments. Break through the denial. Recognize that numbness has a purpose: It keeps you from falling apart. But if feelings of distance and unreality are bothering you, use family members and close friends as touchstones. Prevent yourself from “stuffing” your feelings by checking in with others: How are you holding up? Create opportunities to talk over the experiences you’ve been through and reminisce about your loved one. When the protective curtain of denial slowly slips aside, intense feelings start to surface. This may be the hardest time, when things seem darkest. Self-blame is common. You may find yourself replaying conversations and decisions in your mind and asking yourself if you should have done things differently. If you’ve lost someone who’s been suffering or in pain, you may experience a complex mix of relief coupled with guilt. It’s common to hear a judging voice in your head, berating you for feeling relieved — but actually relief is a perfectly normal reaction. Extreme mood swings, feeling okay one moment and overwhelmed with sadness the next. Physical and/or emotional exhaustion. You might feel like you can’t get out of bed in the morning, or even like you can’t go on any longer. Guilt — if you’ve lost someone who died relatively young, you may feel guilty that you yourself have your health. If you’ve been a primary caregiver, you may feel relieved that the intense period of caregiving is over and you can return to your “normal” life, yet you feel terribly guilty for having such thoughts. Tears that come when you least expect them. Obsessive thought patterns, such as going over in your mind things you did and didn’t do or say. Find ways to turn off the “tapes” replaying themselves in your mind. If there are moments that are particularly traumatic to remember (the decision to turn off life support, for example, or an image of your loved one in pain), talk through the memories with family members and friends who went through them with you. Saying, “I keep thinking of how much pain she was in and wondering if there was more we could have done” allows you to get dark feelings and fears out in the open so that you and others who were present can talk through what happened. Getting everyone’s feelings out in the open allows you to reassure each other that you all did the best you could in a difficult situation. Ask for help. This is the time to find a support group, therapist, or close friend or family member who’s been through something similar, who can help you work through these very difficult feelings. Force yourself to reach out. It’s easy to hide away or isolate yourself when you feel that you’re “not at your best,” but this is just the time to reach out. Put a few close friends or family members on alert by saying, “I’m having a pretty tough time right now. Can I call you when I’m really feeling down?” Setting this up ahead of time gives you permission to pick up the phone. Let yourself off the hook. 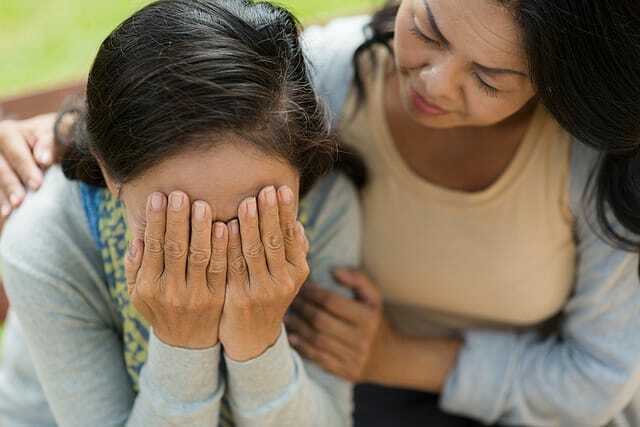 If you’re experiencing guilt for surviving, or relief you’re your loved one’s suffering or your caregiving role is over, remind yourself that those feelings are nothing to feel bad about. The truth is that the person you were caring for is out of pain and some of the burdens that have overwhelmed you have been lifted, so it’s natural to react with relief. For many people, this stage alternates in spurts with pain and guilt. You may find yourself becoming very reactive. You’re going along just fine until something — a TV episode, a story told by a friend, an ad in a magazine — sets off an explosion of angry, even hostile feelings. Sometimes anger is a way to shield ourselves from feeling intense pain; other times it’s the simple contrast between other people’s’ concerns and the sheer magnitude of what we’re going through that triggers an attack of bitterness or frustration. A desire to avoid certain social situations, particularly those where others are celebra tory or self-congratulatory. Irritation when others complain about things that seem petty and unimportant compared with what you’re going through. A tendency to react with mistrust and sarcasm. Anger and bitterness over others’ sincere expressions of sympathy. Someone saying “I understand,” or “Is there something I can do?” might make you want to scream, for instance. Avoid those who bring you down. If you notice that certain people or situations bring on bouts of anger and ill humor, it’s perfectly okay to avoid them — you’re protecting both of you. For instance, if a certain friend tends to initiate a “pity party,” put that friendship on hold for awhile. Tell people what’s happened. It can be hard to bring up a loss, but it’s more uncomfortable still if you keep silent and those around you remain oblivious. When there’s an appropriate opening, explain that you’ve recently experienced a loss. People will be more supportive than you think, and some will really “get it,” resulting in deeper shared connection. This will also stop most of those who are just having a bad day from telling you about it. Have compassion for yourself. When feelings of anger and bitterness are separating you from others, instead of berating yourself for your lack of compassion, turn that compassion on yourself. You’ve just lost someone terribly important to you, and it’s natural for your mind to compare yourself with others and find their situations less traumatic. Talk to yourself with sympathy and forgiveness and remind yourself that you won’t always feel this way. No matter how deep your grief, slowly but surely you’ll be pulled back into the world — perhaps even against your will. Life has a way of throwing moments our way that wake us to the possibilities still in front of us. But at first, it’s almost certainly going to feel like one step forward, two steps back. That’s okay. Bit by bit, your mind will accept what’s happened, and you’ll discover new reserves of strength and resilience. Remember all the people who helped you through your loved one’s last illness? There are others out there for whom you can perform the same valuable service, with a new depth of compassion and understanding. A sense of “waking up” to the world around you. If you’ve lost your second parent, you may feel a sense of moving forward into a new phase of your life. Now you’re the “older generation” in your family, which can feel scary and sad. But over time it may also feel freeing. Even if most of the time you’re still very low, you’ll start to see that there is a way past the grief . Things can seem funny again. Whereas a few months ago you avoided silly movies and didn’t find jokes funny, now every once in a while something makes you laugh or smile. A return to awareness. You notice the smell of roasting coffee or a friend’s new scarf. The rediscovery of old satisfactions: You might realize you want to resume knitting, start a new book, or rejoin a volunteer effort that used to be important to you. At least for short periods, you feel like yourself again. Seek out experiences that feel meaningful. If seeing your grandchildren is the only thing that gets you out of bed in the morning, make as many dates as possible to spend time with them. If watching birds at the bird feeder lifts your spirits in midwinter, keep the feeder filled and perhaps invest in a bird guide and try to identify your winter visitors. Fight “survivor’s guilt.” Don’t feel bad about being happy. Life goes on, and we’re meant to go on with it. If the moments are few and far between, notice them and seek out similar moments. Ask yourself what your loved one would have wished for you — to see you in perpetual mourning or happy to see you rediscovering joy in life? Give back to others. Many people, when grieving a loss, find solace in helping others. It can take you out of yourself and put things in perspective to help others in need. Volunteer in your community or at your place of worship, or offer to help a friend or neighbor who is going through a hard time. What is the first step people should take as they consider end-of-life care? Accept that death is a part of our reality. 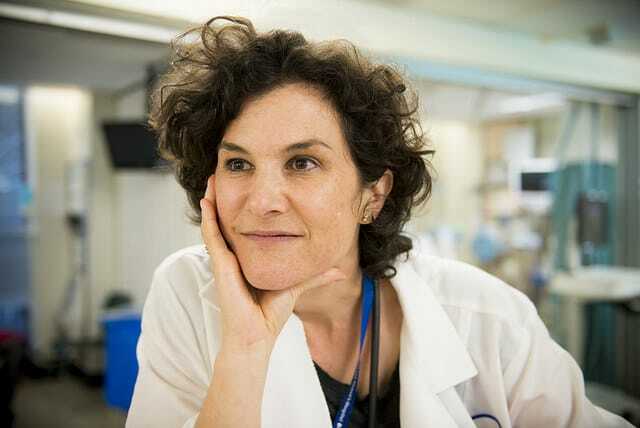 There’s no magic pill – we can do a lot in the ICU, but we can’t fight death – it happens. So you have to be able to accept that, and when it actually happens you have to be receptive to it. You can’t ignore it, deny it, or not want your doctor to tell you the bad news. You want to really understand that you will ultimately die and when you start to die, you want that information. How can someone prepare for death? You need to have done your homework. There are so many personal preferences that only you can know, and if you don’t think about them, clarify them and present them to the people around you and your healthcare team, how can they possibly know? There are many different resources to do it – and I have a lot of them in my book –for eliciting and understanding your own preferences and then communicating them. There are games, there are documents, there’s all sorts of stuff. You want this preparation step to be a fully fleshed out, with deep nuanced conversation over years, which will change as you get sick and as you progress through your life. You have to do the brave and courageous work of preparing. How should patients and family members ask their doctors about their end-of-life care? Communication is a two-way street. Patients don’t want to hear bad news. There are studies that show that people think doctors who break bad news are not as nice as doctors who break good news. There’s data on this. Patients want doctors with good news, and doctors want to be liked too. We know that when people do have these conversations…patients choose differently. They choose to use much less technology and they die better, according to their surrogates, and they don’t really live any shorter. And people can have really beautiful deaths if they’re prepared, so the communication piece is really important going both ways.